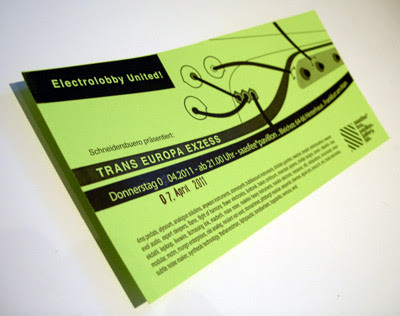 A heads-up about Schneidersbuero's Superbooth tour, TransEuropaExzess, which kicks off with a special evening event during the Musikmesse next week in Frankfurt. 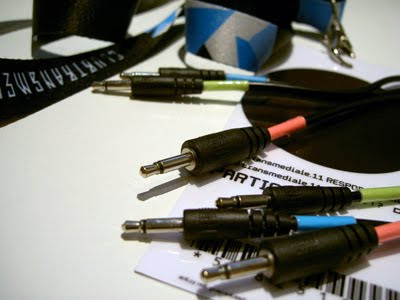 Look forward to the new Modular Merry-Go-Round, drinks and live performances from 4ms and others at the Saasfee Pavillion on Thursday, 7th April from 9 p.m.
More details about the Superbooth here. I recently stumbled across the Nord Modular's exponential shaper module while looking for something to bend a signal. The ShpExp works with transfer functions to generate non-linear distortion. This can give a sound edge, without totally shredding it. Of course, my next thought was whether it would be possible to patch something similar with my system. As usual, Rob Hordijk had the answer. 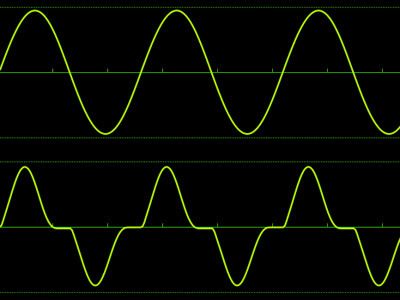 Feeding the rectified, frequency-doubled signal back to the source, rather than the VCA, will bend the sine into a triangle, albeit with a different pitch. 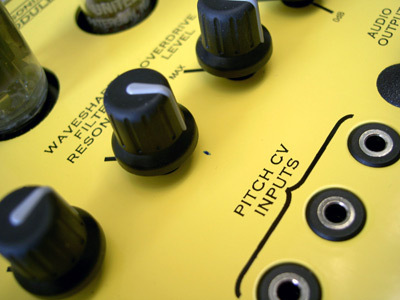 Try varying the FM-CV amount, other VCO waveforms or even polyphonic signals for seriously warped shapes. I used the VCO-2RM and A-133 which, being dual, allows one to cascade and further multiply the modulator. 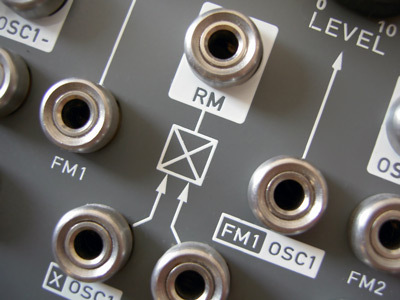 Frequency doubling or rectification can also be achieved by feeding +ve & -ve signals to a min/max analogue logic module like the A-172 & Maths' OR processor or Doepfer's A-119 ext. input module, as per this Patch Tip. Like the A-133, Fonitronik's forthcoming mh31 and Makenoise's modDemix provide one-stop solutions. I'm not sure if this process is in fact single-sideband modulation as the modDemix description suggests, but it's certainly closely related to Amplitude Modulation which will be the subject of the next Patch Tip. Both releases are available for €3+ each or €1 per track. Enjoy the sounds and thanks for your support! Tracks like a zombie, but kicks like a mule - my first taste of yellow. As Metasonix own video makes hilariously clear, you're never going to play Switched on Bach with the R54. Feed the Supermodule with the appropriate combination of CVs, however, and you can coax deep drums, watery plops, rubber basslines and tortured-animal sounds from this unruly, tube-based VCF/ VCO. Taming the R54 is complicated by some crafty normalization - both the audio and CV inputs also function as outputs. Silent Way failed to map a suitable set of voltages, but this is hardly surprising given the amount of slew of the vactrol-based inputs. I've found plugging every socket helps, typically a short trigger to the audio input and an offset, 'pitch' CV and short envelope to the rest. The R54 is a wonderfully idiosyncratic oscillator and makes a great, if contrary, companion to the green in my system. While other VCOs might be a better choice for melodic lines, for low-end wobbles and percussive patterns the R54 is hard to beat.